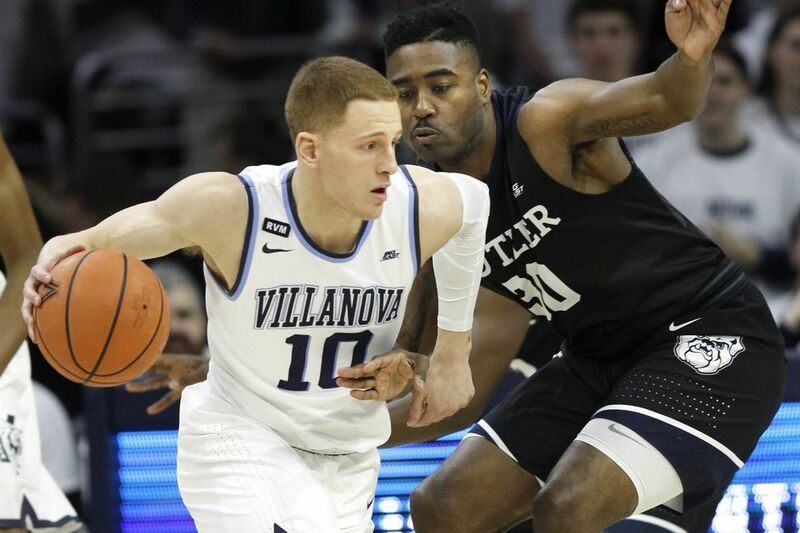 Villanova guard Donte DiVincenzo scored a career-high 30 points in his last outing. Villanova had been one of the nation's best three-point shooting teams all season before hitting some rough patches in its last two games against opponents determined to stop the Wildcats at the arc. The Cats, who dipped from five straight weeks at No. 1 to No. 3 in this week's AP poll, are coming off their worst two-game stretch of the season against St. John's and Butler, going 14 of 51 from deep for 27.5 percent, well off their season mark that now stands at 40.8 percent. The Wildcats (23-2, 10-2 Big East) face another tough perimeter defense Wednesday night when they head to Providence (16-9, 7-5) to begin a stretch of four road games in the next five. The Friars are second in the conference in defending the three, at 32.0 percent. "We have to realize what teams are doing to take away threes," Villanova coach Jay Wright said Tuesday after practice. "You can't miss your opportunities when you have them, but you can't also panic and take bad ones. It's a balance. And you've got to be good at getting the twos you can get. That's what we're trying to do." The Wildcats, who are third in the nation in three-point baskets at 11.5 per game, matched a season low Saturday with six treys against Butler. However, they managed to gain an 86-75 victory thanks to fine one-on-one play going to the basket from both Donte DiVincenzo and Jalen Brunson, who combined to score 57 points and shoot 17 of 27 (63 percent) from inside the arc. "When we catch the ball, we always catch and shoot," said DiVincenzo, who set a career high with 30 points. "We know if their hands are not in our face and we have a good shot that we can step into with confidence and put it up, then we'll take the shot. "If they fly at us and really are in our faces, then we shot-fake, we try to make contact, get them on our hip, get them behind us. Then we can make plays and it opens up the floor for us." The Wildcats may get one of their better three-point shooters back at the Dunkin Donuts Center. Junior forward Eric Paschall, who has shot 54.8 percent from the arc in conference games, practiced for the first time Tuesday since going into concussion protocol on Feb. 7 and would be able to play if he is symptom-free when he is re-examined Wednesday, Wright said. The Wildcats face difficult road games ahead. Though they have beaten the Friars four straight times in Providence, the games have been close, and the crowds loud and large. Shortly after they return home, they must go back out to Xavier, a battle Saturday for first place in the Big East. If Wright knew the identity of the Wildcats' opponent after Providence, he wasn't saying. "We really do take them one at a time," he said. "Our next game is Providence and we're getting prepared for that. We'll come home and we'll figure out what the next game is. That's really the way we do it." Head coach Jay Wright reacts during the first half of Villanova’s win over Butler on Feb. 10.